In addition to direct modification of the debug setting as described by Marine we have added an option in Preferences for the new feature controlling whether to render rigged mesh attachments in mouselook when they are attached to one of the head attachment points (bear in mind that there’s no actual relationship with rigged mesh between where something is attached and where it appears on the avatar – the latter is a fixed property of the rigged mesh). This appears on the Kokua/General section of the Preferences window, as shown below. 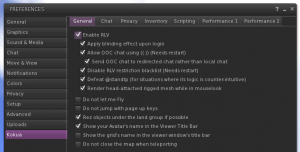 The non-RLV version gets a new feature designed to reduce the amount of chat spam generated by any RLV items when used with the non-RLV version. The new feature, which is turned on by default, will issue a message once in local chat privately to the wearer and then future RLV commands will be silently discarded until either the next login or the option is disabled and re-enabled. The image below shows how this appears in the conversations window. At present, there are no plans to implement this within the RLV version for when RLV is turned off (generally, I feel it’s better to see the RLV chat in that situation since the usual reason for a RLV viewer user to turn off RLV is to perform some kind of troubleshooting and thus seeing the commands is probably beneficial). However, if it’s requested we’ll implement it on RLV too (although it will probably be off by default rather than on by default as it is in the non-RLV version). Implement Ansariel’s experimental FIRE-12004 fix from Firestorm which may help with preventing attachments going missing after teleport. If any adverse experiences occur the fix can be disabled by changing debug setting FSExperimentalLostAttachmentsFix to False. Various World Map improvements (also mostly by Ansariel) including speed-ups, alphabetical sorting of friends, alphabetical sorting of landmarks, hiding duplicate landmarks and the display of the parcel name (instead of just the region name) when a location is clicked within the map area. There will always be a slight delay between clicking the world map and the parcel name being displayed because the viewer has to communicate with the server to get the parcel details.